What if you could walk across lily pads and floating plants without sinking? Sitatungas can. 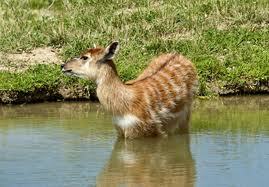 Sitatungas are the only species of aquatic antelope. They live in swamps and muddy woodlands in Central Africa. Their hooves are specially made for walking through water. 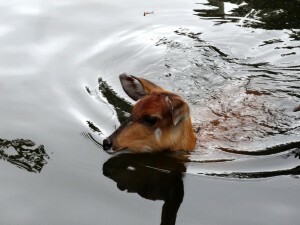 All about Sitatungas, the only species of aquatic antelope. They live in swamps and muddy woodlands in Central Africa. Sitatungas hide from predators in the swamp. If a leopard, lion or wild dog appears, they head for the water. In the water, they must watch out for crocodiles and pythons. Their hooves are specially made for walking through water. Sitatungas eat grass, fallen fruit and water plants. Sitatungas stamp down grass in the swamp to make a cozy bed. Mothers have their babies on these beds. The babies stay there hidden for several weeks. 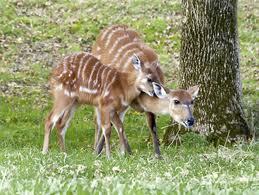 Sitatungas are well-hidden in their habitat, but they trample down grass to make paths. If you watch for these paths, you just might find their hiding place. Males weigh between 150 and 275 pounds; females weigh between 110 and 125 pounds. Sitatungas are slow swimmers, but they can paddle for miles. 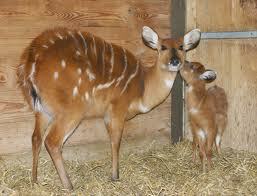 A video about a sitatunga in Chester Zoo taking a drink. Answer: Yes, sitatungas are slow swimmers, but they can paddle for miles. They sometimes hide in the water with only their noses and eyes showing. Question: Do humans hunt sitatungas? Answer: Yes, in some places humans hunt these animals by setting traps along their paths. Enjoyed the Easy Science for Kids Website all about Sitatungas info? Take the FREE & fun Sitatungas quiz and download FREE Sitatungas worksheet for kids. For lengthy info click here.